When I’m cooking I like to think about what will take the longest. 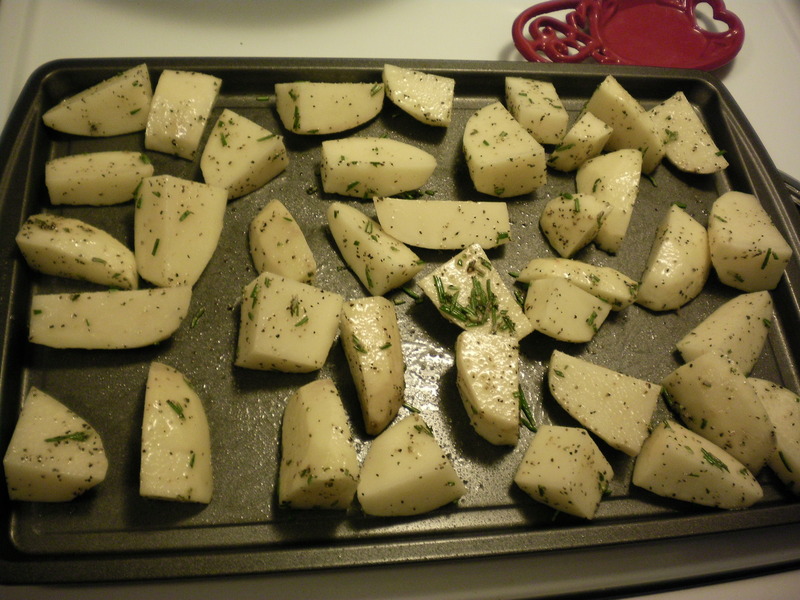 In this case, I know its the potatoes since they will be roasting in the oven. So you should get those ready first. Preheat your oven to 425. Peel the potatoes and cut them up. I cut each one into eight chunky pieces. I don’t know how many you’re feeding but a good rule is one potato per adult and about a half a potato per child. The rule in my house is about 3 per fireman and one per bluebird. Anyway, put the potatoes in a mixing bowl and drizzle olive oil over the top. Just eyeball it. I will not be deducting any points of you use a little more than you should have. Salt and pepper (a couple good pinches) go on top and then your chopped up rosemary leaves. Spread them out on a cookie sheet and toss them in there til they are nice and brown looking. Ok, so thats out of our way. Just check in on them once in a while to see how they’re coming along. It will be a while. Probly about 30-ish minutes. When they start to look like they’re well on their way, take your pork chops, season them with Lawry’s Seasoned Salt and pepper. Drizzle some olive oil in a hot skillet and cook them til they’re done and golden on each side with a nice crispy crust. While the chops are getting their makeover, go ahead and start the Mock Fried Corn. Grab the canned corn and open ’em up! Have you ever had real southern friend corn? This summer I will feature my grandmother’s recipe and you will bless the day you heard about this little blog but for now, this version will have to do. 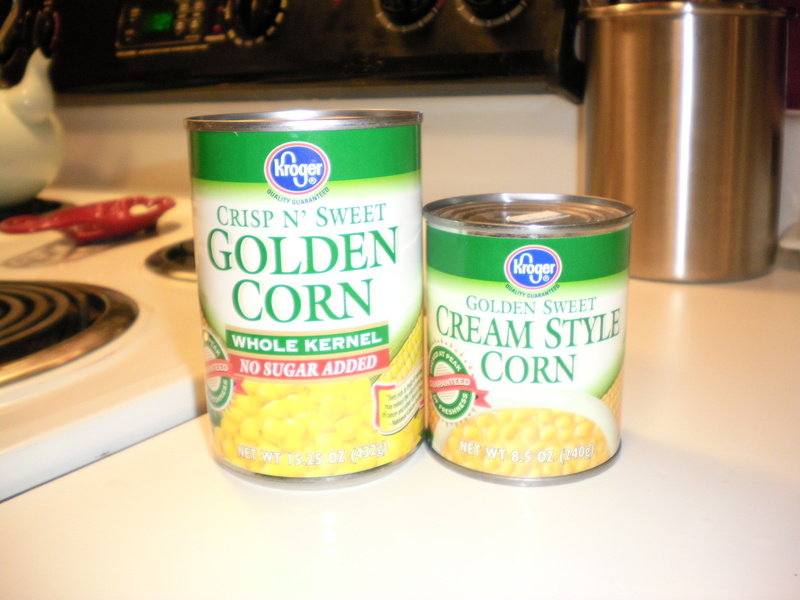 Real fried corn is made with fresh corn on the cob but corn is really not looking so hot in the produce section and I had these 2 lonely cans in my pantry begging to be loved. 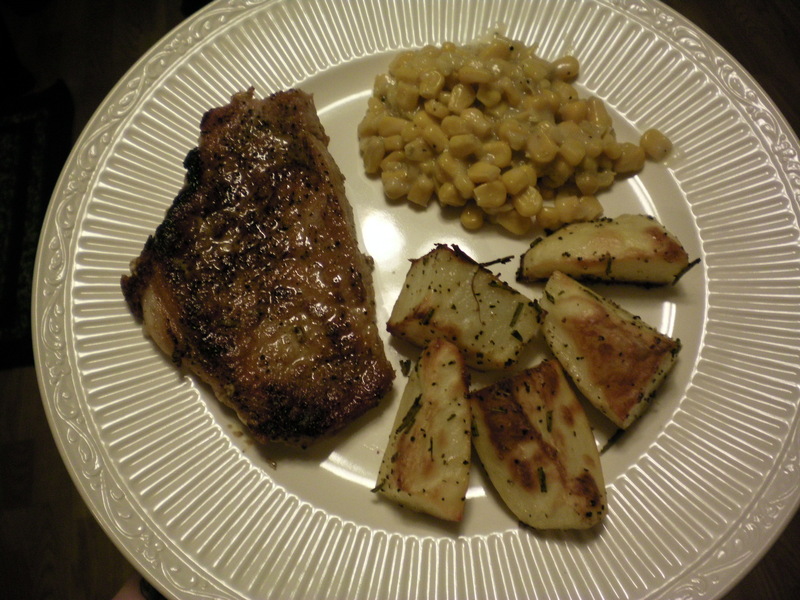 So I came up with this almost as delicious version and my fireman had 2 helpings…. Ok so grab yer skillet and put it over medium heat. Put a tablespoon of butter in it and let it melt. 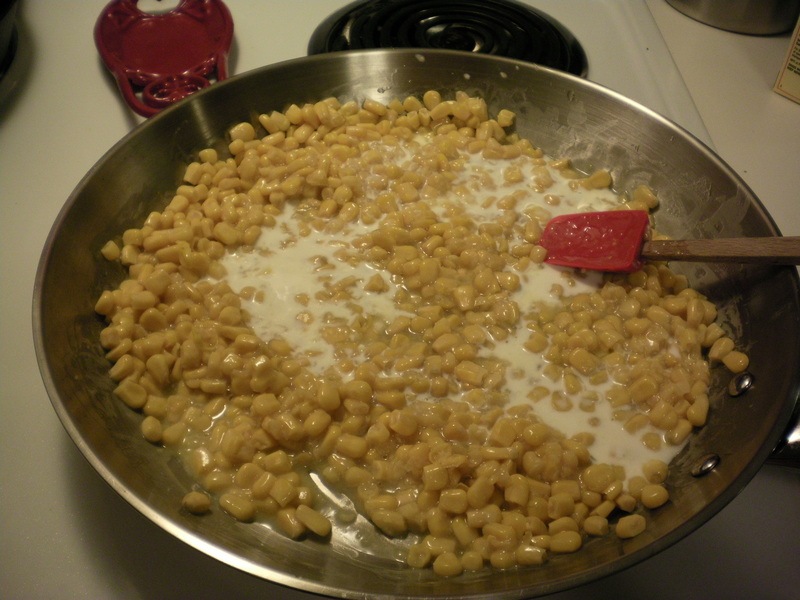 Put both cans of corn in the skillet and mix them around together. Add salt and pepper to taste (i use more pepper than usual because its nice to have that slight bite in the sweetness of the corn) and about a scant teaspoon of sugar. Mix it all up and add a splash of half and half. Enjoy this dinner with family or friends. Thank you for stopping in and I hope to see you back real soon! it was so yummy! thanks for having me over! Such a sense of humor…slap your Momma and shut the front door! gaghhh! This iPad always wants to turn my name into “Trash” instead of Trish. Yay! I’m excited to stalk you here.